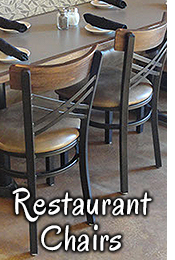 Restaurant Chairs, Stools, Booths And Everything You Need! You Won't Find More Affordable - High Quality Products ANYWHERE Else. A Moment in Time Retro Design offers a lot of great products to choose from. 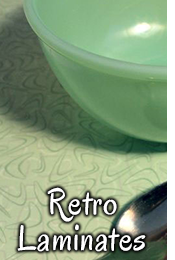 For home owners our retro furniture is perfect for your kitchen. 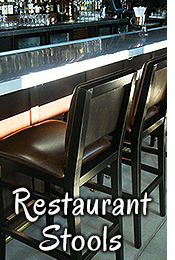 Choose from bar stools, chairs, booths, tables, and more. We turn ordinary kitchens into dream kitchens. 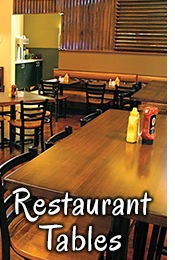 For restaurants we offer a variety of diner furniture such as restaurant stools, chairs, and diner booths. Ice cream shops love our furniture too! All furniture is customimzable so there is no need to worry about your new products matching everything else in your home. With our wide selection of laminates. You can see for yourself that Heffron's offers a lot of great products. 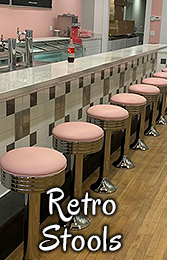 From Retro kitchen furniture like bar stools, chairs, booths, tables, and more. We turn ordinary kitchens into dream kitchens. 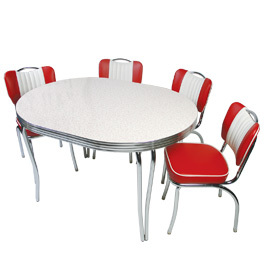 We offer a lot of options when it comes to how you want your tables, Retro Chairs and Stools to look. No need to worry about your new products matching everything else in your home. With our wide variety of Laminates and Vinyl, you'll be sure to find something you love! Largest selection of Retro Furniture and Home Bars found anywhere. 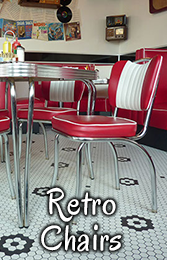 Check out endless selections of Retro Furniture, 1950's Retro Backyard Diners, Restaurant Stools, Chairs, Booths, Vintage Furniture, Retro Neon and Tin Signs, Retro Tableware and many more retro products from the 1950's from the people and manufacturers who made them. 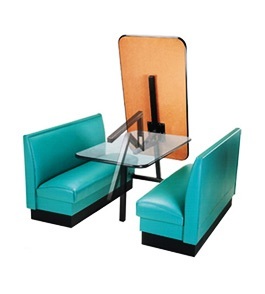 Our customer service and quality of 1950's Furniture is the best around. 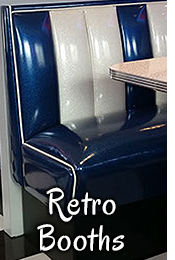 All of our Retro Seating is new, but custom made by the people who made it in the 40's and 50's. 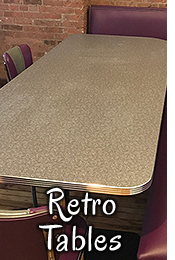 In addition, our line of Retro Restaurant Furniture, Retro Home Bars, Retro Basement Bars, Retro Bar Furniture, Vintage Home Decor, Retro Stools, Retro Tables, Vintage Kitchen Furniture, and Retro Game Room Bars are designed as a "signature" piece for your "retro" room, or diner. Due to the large amount of orders we receive from overseas, Heffron's has decided to expand and grow our business even larger. 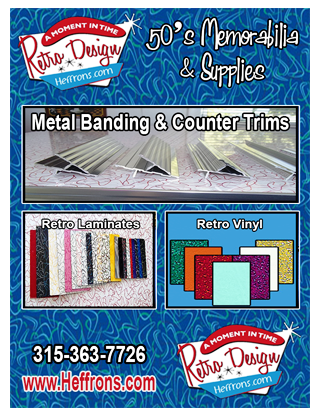 That is why we have expanded our locations of shipment so that no matter where you are located, we can send you the 1950's Retro products you desire. 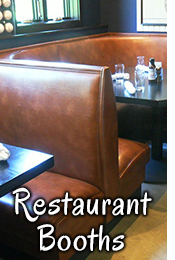 Laminates, Stools, Booths, Tables and more. 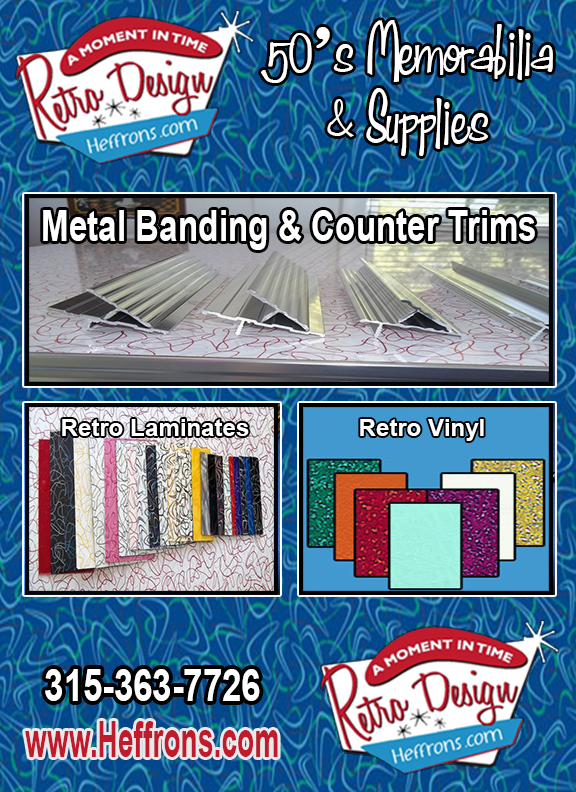 At Heffron's A Moment in Time Retro Design you can be sure to get the highest quality products at the best prices possible. Its a deal you don't want to miss out on. No one can match us in terms of affordability, quality and customer service. 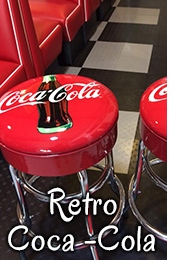 Give us a call letting us know how Heffron's can help you get all of your Retro Tables, Retro Stools, Retro Formica, Neon Signs or any other Vintage Furniture or Vintage Retro Decor today. Looking to add some brand appeal to your retro kitchen? We have top of the line 1950’s Coca-Cola and Retro Coke products for you to look through. We also now offer something special for car fans. Our car couches, car desks, and car sofa's are made from real cars and looks awesome anywhere in your home or garage. Finally don't forget about our Retro Appliances including our northstar and elmira refridgerators, stoves, microwaves and so much more. One of the great things about shopping at Heffron's is that the photos on our website arn't your only options. Want a different sized metal banding? We can help with that. Want to choose a different style or color retro laminate such as our Cracked Ice Laminate, Boomerang Laminate, or Retro Laminates? Go right ahead. The same goes for our retro vinyl collection too! 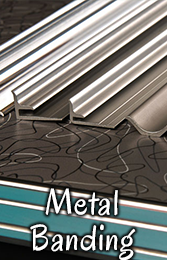 We have 5 different grades of vinyl to choose from. The quality is the same but the design and colors are yours to choose. Decorate your walls with style with our Retro Décor collection. From Retro Neon Clocks, Coca Cola Neon. Turn down the lights and wow your guests with a marvelous display of neon color. We also have Retro Neon Coke and 1950’s Budweiser Licensed items as well. Finally make sure you check out some of our newest products such as our car couches. 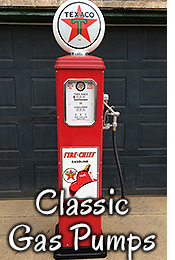 These items are the perfect combination of Automobile and Retro. From Car Sofas, Chairs, Desks, Bars and Car Counters, you'll be sure to find something you love. We also are spicing up your kitchen like never before. Our new Antique and Northstar Appliances are sure to wow your family and friends. These Retro Refridgerators, Ranges, Microwaves, and Fridges are just what your kitchen has been missing.